The newest residents of Temple Towers had more than renovations to anticipate. Some will live with more people than expected. Last week, students moved into the newly renovated Temple Towers dormitories. When sophomore Ashley Pro walked into her living unit, she said she and her roommate noticed the bedroom was very small and said the way it was arranged gave them little space. Space is the overarching concern from students in the aftermath of the Temple Towers overhaul. 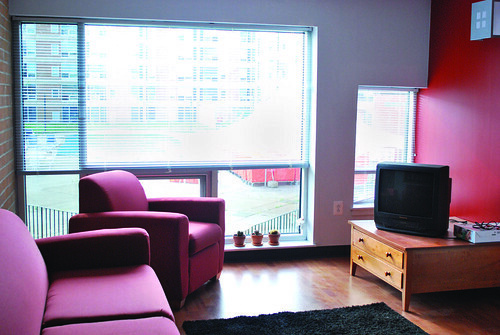 Students moving into one of Temple Towers’ reconfigured six- or eight-person apartments must adjust to living in crowded quarters. Associate Vice President for Student Affairs Michael Scales said students were informed of the room configurations via e-mail and in person during special sessions. This is not the case, however, with students like sophomore economics major Colin Saltry. Saltry, who is also a Temple Student Government senate clerk, said he was so upset about the situation that he backed out. He now lives in an off-campus apartment. “Living with three people is certainly difficult enough, and having to live with [up to] seven changes the whole game,” Saltry said. Saltry was not the only person to decline Temple Towers after the changes were announced. Sophomore political science major Prince Schultz backed out of his Towers living arrangement as well, electing to instead move into the Elmira Jeffries housing development on 15th and Jefferson streets. “A spot opened up, so I took it. Now I don’t have to live with seven roommates,” Schultz said. Other students chose to adapt to the situation and stay at Towers. Pro found roommates for her unit immediately after University Housing notified students. All seven of her roommates were already friends before moving together. Seven roommates also greeted Kristie Hartz, an undeclared sophomore, when she moved into Temple Towers Sunday. Unlike Pro, she only previously knew three of her roommates. Hartz said she thinks students in this living arrangement are being overcharged. “I could have found off-campus housing for less if I had had more time to look,” she said. Scales said the Temple Towers building needed major renovations. It took 13 weeks to complete renovations, which also included the removal of balconies for more square footage. New furniture and appliances, granite counter tops, laminate and carpet flooring, renovated lounges and new sprinkler systems are also among the renovation features. Two-, four- and six-person apartments cost $3,670 a semester. To accommodate disgruntled students, University Housing adjusted the rate for eight-person apartments by $200 per semester, decreasing it to $3,470. Many students, including Saltry and Hartz, said they still feel the accommodations were not enough, especially given the short notice. They said they plan to continue bringing up the issue with TSG, which supported students displeased with the Towers situation. Saltry, who has had multiple meetings with University Housing officials, said TSG will monitor the situation.